Pine bark extract is a complex mixture of organic molecules, of which proanthocyanidins and phenolic acids are most interesting. These ingredients are frequently used both in nutritional supplements and dermal applications, mostly due to their strong antioxidative capabilities . While individual components are still difficult to research, the benefits of whole extract have been observed in various systems of the body, from UV protection of the skin and melanoma inhibition, to alleviating smoking damage and premenstrual symptoms . It is known that pine bark can effectively reduce inflammation of the skin cells. Inflammation of the skin is often studied by exposing the skin to high UV doses, thus causing a reaction called sunburn. It was shown that pine bark applications reduce this reaction markedly . It can also be used as a preventive measure, for example, cells pretreated with pine bark extract showed 70 % less signs of inflammation than untreated cells . However, the anti-inflammatory effect has not been tracked down to a single component, so likely the extract has numerous ingredients that work together and cannot be replicated in a laboratory yet . Surprisingly, in cases when stronger immune response is actually needed, pine bark extract can adapt to this function as well and promote immune reactions. In mice, treated with UV and certain drugs suppressing the immune system, dermal application of pine bark-containing cream reduced the suppression 4 times, thus strengthening the protective functions of the skin . Concerning UV exposure, several other benefits of pine bark extract have been observed. Erythema (redness), induced by these waves, is effectively reduced by the extract . Similar effect was proven in mice, using creams with 0.05-0.2 % pine bark extract. The extract also delayed the appearance of UV-induced tumors, and the 0.2 % cream fully prevented some mice from developing cancer . Pine bark extract is even able to protect the skin cells from more potent chemical carcinogens . Erythema, inflammation and tissue damage can also be caused by skin contact with ions of heavy metals, such as chromium. Experiments with animal skin show that the antioxidants contained in pine bark extract provide a useful defense against these toxins . Postmenopausal women often experience skin dryness, and pine bark extract is particularly useful in treating this condition. It was found that this extract can significantly improve hydration and elasticity of such dry skin. It is achieved by increasing the synthesis of collagen and hyaluronic acid, so this extract is likely to bring similar benefits for any skin with ageing symptoms . Pine bark extract also promotes health of the vascular system. It is able to relax blood vessel walls and in this way reduce blood pressure in animals with hypertension . The antioxidants found in the extract also protect the capillaries, thus it is suggested as a preventive measure against various cardiovascular diseases. Additionally, the extract helps to regulate capillary growth after UV exposure . Blood vessel growth is also important in repairing injuries. This process can also be enhanced by applying a cream with 2 % pine extract – it helps to reduce inflammation, causes faster healing, and even helps reduce pain in burn wounds , . 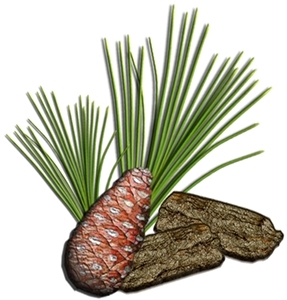 This Pine Bark extract contains 95% Proanthocyanidins extracted from Pinus Massoniana Lamb. Customers, please note that this product is NOT Pycnogenol tm. Pycnogenol tm is the patented trade name for Proanthocyanidins extracted from the French maritime pine, Pinus maritima. A. Yoshida, F. Yoshino, M. Tsubata, M. Ikeguchi, T. Nakamura, and M.-C.-I. Lee, “Direct assessment by electron spin resonance spectroscopy of the antioxidant effects of French maritime pine bark extract in the maxillofacial region of hairless mice,” J. Clin. Biochem. Nutr., vol. 49, no. 2, pp. 79–86, Sep. 2011. P. Rohdewald, “A review of the French maritime pine bark extract (Pycnogenol), a herbal medication with a diverse clinical pharmacology,” Int. J. Clin. Pharmacol. Ther., vol. 40, no. 4, pp. 158–168, Apr. 2002. S. Sime and V. E. Reeve, “Protection from inflammation, immunosuppression and carcinogenesis induced by UV radiation in mice by topical Pycnogenol,” Photochem. Photobiol., vol. 79, no. 2, pp. 193–198, Feb. 2004. T. Bito, S. Roy, C. K. Sen, and L. Packer, “Pine bark extract pycnogenol downregulates IFN-gamma-induced adhesion of T cells to human keratinocytes by inhibiting inducible ICAM-1 expression,” Free Radic. Biol. Med., vol. 28, no. 2, pp. 219–227, Jan. 2000. C. Wu, D. Feng, H. Ma, H. Xie, H. Wang, and J. Wang, “Effect of Pinus massoniana bark extract on IFN-gamma-induced ICAM-1 expression in HaCaT human keratinocytes,” J. Ethnopharmacol., vol. 122, no. 1, pp. 48–53, Feb. 2009. C. Saliou, G. Rimbach, H. Moini, L. McLaughlin, S. Hosseini, J. Lee, R. R. Watson, and L. Packer, “Solar ultraviolet-induced erythema in human skin and nuclear factor-kappa-B-dependent gene expression in keratinocytes are modulated by a French maritime pine bark extract,” Free Radic. Biol. Med., vol. 30, no. 2, pp. 154–160, Jan. 2001. M. Kyriazi, D. Yova, M. Rallis, and A. Lima, “Cancer chemopreventive effects of Pinus Maritima bark extract on ultraviolet radiation and ultraviolet radiation-7,12,dimethylbenz(a)anthracene induced skin carcinogenesis of hairless mice,” Cancer Lett., vol. 237, no. 2, pp. 234–241, Jun. 2006. I.-C. Lee, S.-H. Kim, I.-S. Shin, C. Moon, S.-H. Park, S.-H. Kim, S.-C. Park, H.-C. Kim, and J.-C. Kim, “Protective effects of pine bark extract on hexavalent chromium-induced dermatotoxicity in rats,” Phytother. Res. PTR, vol. 26, no. 10, pp. 1534–1540, Oct. 2012. A. Marini, S. Grether-Beck, T. Jaenicke, M. Weber, C. Burki, P. Formann, H. Brenden, F. Schönlau, and J. Krutmann, “Pycnogenol® effects on skin elasticity and hydration coincide with increased gene expressions of collagen type I and hyaluronic acid synthase in women,” Skin Pharmacol. Physiol., vol. 25, no. 2, pp. 86–92, 2012. M. Ohkita, Y. Kiso, and Y. Matsumura, “Pharmacology in health foods: improvement of vascular endothelial function by French maritime pine bark extract (Flavangenol),” J. Pharmacol. Sci., vol. 115, no. 4, pp. 461–465, 2011. Y. Kimura and M. Sumiyoshi, “French maritime pine bark (Pinus maritima Lam.) extract (Flavangenol) prevents chronic UVB radiation-induced skin damage and carcinogenesis in melanin-possessing hairless mice,” Photochem. Photobiol., vol. 86, no. 4, pp. 955–963, Aug. 2010. E. O. Cetin, O. Yesil-Celiktas, T. Cavusoglu, E. Demirel-Sezer, O. Akdemir, and Y. Uyanikgil, “Incision wound healing activity of pine bark extract containing topical formulations: a study with histopathological and biochemical analyses in albino rats,” Pharm., vol. 68, no. 1, pp. 75–80, Jan. 2013. S. P. Clark, W. B. Bollag, K. N. Westlund, F. Ma, G. Falls, D. Xie, M. Johnson, C. M. Isales, and M. H. Bhattacharyya, “Pine oil effects on chemical and thermal injury in mice and cultured mouse dorsal root ganglion neurons,” Phytother. Res. PTR, vol. 28, no. 2, pp. 252–260, Feb. 2014.